Today I’m choosing life. Again. Again. Another another attempt at recovery. Two lies have hindered this journey: the first being that one day I’ll wake up and I’ll finally be ‘done’ – I’ll have earned Gloria’s approval. The second is that choosing recovery will be straightforward and easy. Like I just have to actually choose and that will flip a switch and it will all be gone, done, finished and I’ll be fine. How do I combat my own thoughts and unrealistic expectations of myself? I, Hannah, know the standards to which Gloria holds me are unachievable and downright unhealthy. ‘Perfection’ in the body I have will never happen. I’m short, with short legs, a high flat bust and wide shoulders. I am ok with that. That’s me. Gloria isn’t trying to attain a magazine image, even she’s not that irrational. The aim is to be as small as possible – to be able to curl up into the tiniest ball and hide away. To be strong and invincible and the way to do that is restriction and extreme control. But I will never be small enough. I think the ultimate goal is complete implosion. The other lie is harder to explain and fight against. The feeling of being safe as I engage in these behaviours is so strong. The peace and calm I feel when I don’t eat is bliss. The lie I cling to is that if I choose to stop all this then chaos will suddenly pour down and it will be all my fault for walking away. But I have little glimpses of what life could be like without this. Enough to see that this is not achieving any of the peace I truly want. I already have so many positives in my life that will be lost if I continue this way. Choosing them over Gloria should be the easiest thing to do, but it’s not. 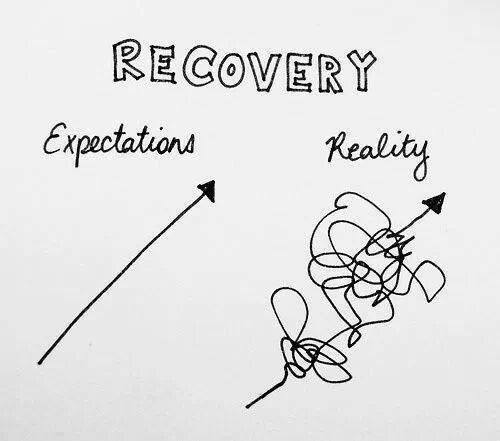 And every time I choose recovery, I seem to forget that it’s not a straight, easy road. I’ve said it before – I can’t just walk away from this voice. But I can choose to fight it. And I am.